Features exceptionally bright and uniform LED illumination and Nikon's high-quality optics. Ergonomic and anti-mold design ensures years of comfortable and stable use. With the ECLIPSE E200, Nikon has designed a simple and easy-to-use system that reduces fatigue from use over long periods. 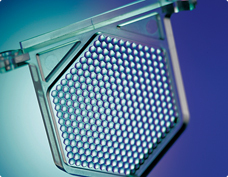 With a robust structure and anti-mold design, the ECLIPSE E200 offers high quality and accuracy that can be retained for years even in hot and humid environments. 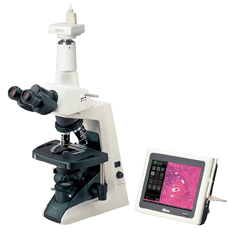 The ECLIPSE E200 offers exceptional operability and durability, and high-quality images. 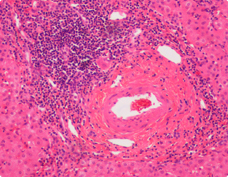 It can be used for various purposes, such as educational, clinical laboratory use and basic research. The newly developed Eco-illumination provides enough brightness for both phase contrast observation and simple polarizing observation. 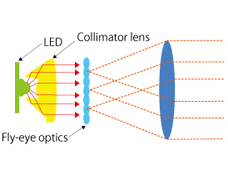 With a fly-eye lens in the illumination system, uniform brightness is provided in the entire field of view. LEDs are environmentally friendly, consume less power than halogen lamps, and last approximately 60,000 hours, reducing costs and the need for frequent lamp replacement. The color temperature does not change when magnification is changed. A halogen illumination model is also available. CFI60 optics combine Nikon's renowned CF optics with infinity optics to produce breathtakingly sharp and clear image hitherto only available with more expensive models, while providing longer working distances and higher NA's. The E200 provides a wide selection of objectives to choose from, including the CFI E Plan Achromat objectives specially developed for the E200 in addition to other higher-grade ECLIPSE series objectives. By using anti-mold paint and sealing anti-mold agent inside, the E200 is designed for use even in hot and humid environments. The focus knob and the stage handle are positioned equidistant from the operator, allowing use without twisting the shoulders. 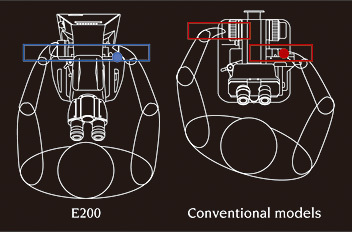 Because these controls are in a low position, users can rest their arms on the desk while working. The eyepoint height can be raised 34 mm when interpupillary distance is 64 mm by simply swinging the front part of the eyepiece tube up 180°. 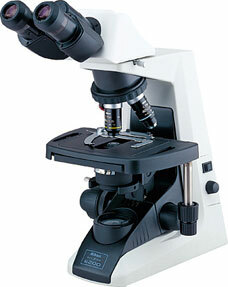 The E200's eyepieces feature a wider field of view for a microscope of this class and are available in 10x (F.O.V. 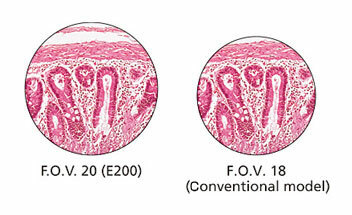 20) and 15x (F.O.V. 12) types. 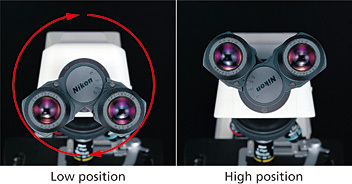 *With a 4x objective lens, the image may show uneven illumination depending on the camera used.